Conrad Swanson of the Colorado Springs Gazette reports that Jillian Likness, the GOP nominee for HD 18, has withdrawn her candidacy just ten days after making the ballot, citing a health condition. Some context for this breaking news- this very same situation occurred in 2016. For the second election in a row, the Republican nominated by the party to represent HD18 has dropped out prior to the general election. Two years ago, Republican Sonya Rose won the nomination at assembly, but by mid-August she decided she couldn’t devote the time required to the campaign and she withdrew. The Colorado Independent’s Corey Hutchins covered the subsequent vacancy meeting to select a new candidate. Speaking from a lectern, Rose nominates local land surveyor Cameron Forth for the post. His previous political experience includes running for Congress in Idaho as an independent a decade ago*. “I don’t even know anyone in this room,” Forth says to the assembled local Republicans when he accepts the nomination. Hutchins went on to report that two other attendees were also nominated, Al Loma and Pat McIntire. Forth won the vacancy vote and became the new nominee, losing handily to the popular incumbent, Rep. Pete Lee (D – Colorado Springs). If McIntire’s name is familiar, it’s because two years later, he’s finally going to get to challenge Rep. Lee in a general election. He’s the Republican nominee for State Senate District 11. In November he’ll face Rep. Lee, who earned the Democratic nomination to replace retiring Senator Mike Merrifield (D – Manitou Springs). Jillian pledged to support the replacement Republican nominee, because she understands how important winning HD 18 is for the State of Colorado. HD 18 will hold a vacancy meeting per the bylaws- and the Party Leadership plans to support the next candidate 110%. No word on when the vacancy meeting will take place. While sooner is clearly better as far as preparing for the election, there’s also the challenge of finding a time that works for at least a quorum’s worth of district party members. The 2016 meeting came up a couple people shy of the required total, forcing the vote to be considered a straw poll that state party chair Steve House used as guidance to appoint the new nominee. Republican control over that El Paso House district may be shaky, if the primary voter turnout is any guide. The two Democratic candidates duked it out with a total of 9,557 ballots turned in, while Likness only managed to garner 5,929 votes total. Look, Republicans, I get why you are having an enthusiasm crisis. Hillary Hating can only take you so far. Obama's enjoying his life now and nobody cares about your Kenyan socialist conspiracies. Your President is an unethical oaf who can't even string a coherent paragraph together, and manages foreign policy by Twitter. Even if you worship him at his rallies, he still sticks it to you with tariffs and tax cuts that 99% of you will never see. America is not only not being made great again, it's well on its way to being a Russian colony. And you have to claim it. You broke it, you bought it. That's OK. You can sit this one out. Democrats have got this. We'll take it from here. Perhaps this is all just a ruse and Likness is deliberating over the invitation to be Walker Simpleton's running mate….. It's probable that a lot of Republican voters skipped that race on their ballot with no opponent for Likness. You're probably right, cook, that Likness was undervoted because she had skipped out of serving as the nominee before. There wasn't any trust that she would serve. But that is an interesting district. El Paso County as a whole had 137, 739 ballots cast in the primary. In Likness' district 18, the Democratic candidates whomped the Republicans 2:1 on primary votes cast, whereas in every other EPCO district, the opposite was true: the R candidate got 2-3X as many votes as did the Team Blue candidate. The only exception was neighboring HD17, in which Republican Kit Roupe was barely outvoted by Democrat Tony Exxum 3598 – 3560. HD17 has seesawed between D & R control for the last few years. Luckily, (or unluckily for Dem fundraising) moderate Roupe is the nominee, not Dr. Wacky-Chaps. So I think that EPCO HDs 17 & 18 might just have some surprises in store for us come November 2018. I hope that the state Dem party will allocate resources to these races. To clarify my somewhat confusing headline- Likness didn't drop out twice, but when she withdrew she became the second consecutive GOP nominee for HD18 to do so- Sonya Rose dropped out in 2016. OK – I normally check those things before I comment, didn't this time. I also misspelled HD17 incumbent Tony Exxum Exum's name. 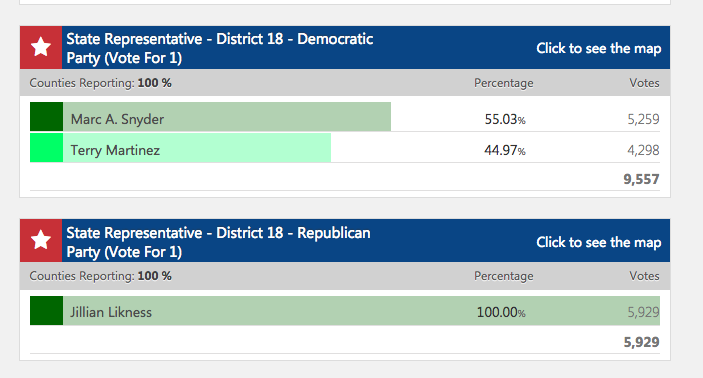 But here's more news about House District 18: Having failed for two elections to field a viable candidate, Republicans are resorting to dirty tricks. Unite Colorado is fielding a "pragmatic, independent grandmother" – Maile Foster – as their candidate for HD18. They're hoping, no doubt, to peel off support from the Democrat, Marc Snyder. . Unite Colorado is essentially a Republican effort to seem centrist and divide Democrats in a "blue wave" year. Foster herself "spent most of her life as a Republican", according to the Independent, and never considered running for office until last spring. Hmmm….wonder what prompted that sudden conversion to being a "pragmatic Independent"? Hopefully, Marc Snyder will build on strong showing of Democrats in the HD18 primary to breeze right past the faux – Independent candidate this year.